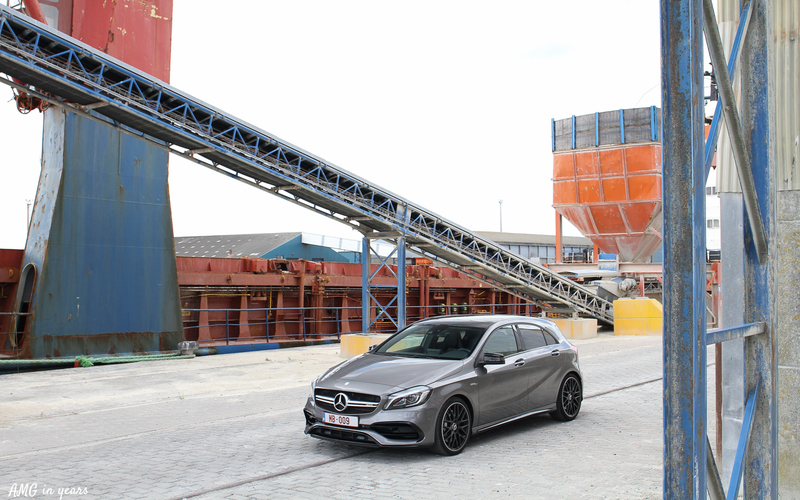 Mercedes is currently working very hard on a brand new A-Class which will be launched next year. 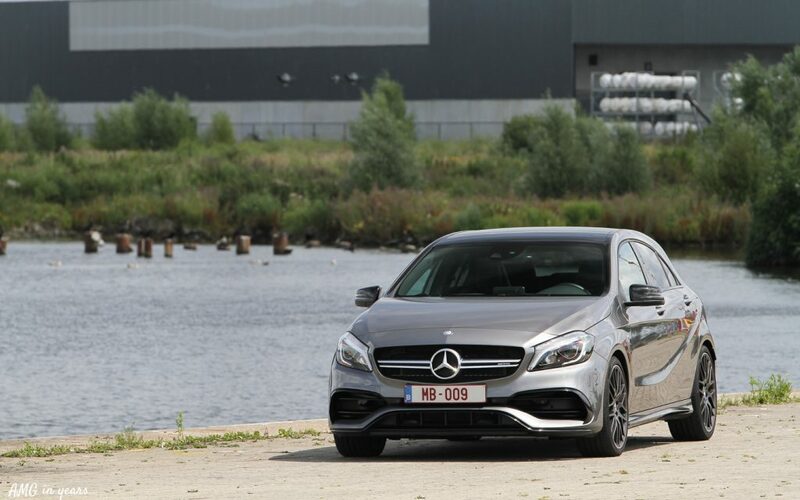 Probably this means that also the A 45 AMG production could come to an end soon. Thanks to Mercedes-Benz Belgium AMG In Years had the chance to finally drive this popular, but pricy hothatch. 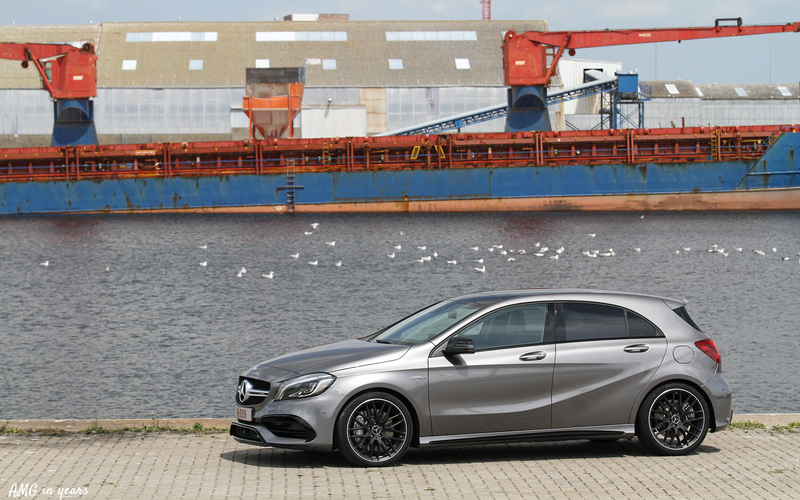 The current A-Class generation is probably the most important car that Mercedes launched in the last 20 years. 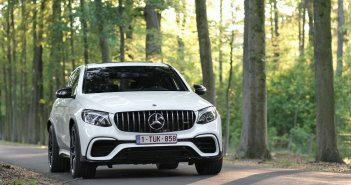 It finally opened the way for Mercedes to a long desired younger public. Thanks to a minor facelift in 2015, the design looks still fresh as a fuss. 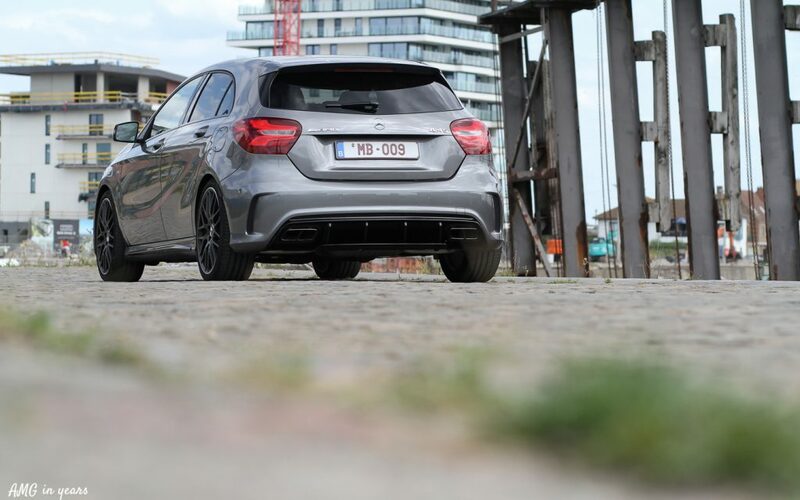 Also the A 45 AMG received the visual fancy adjustments: new inside design of the headlights and backlights, a new grill, bumper and diffuser. 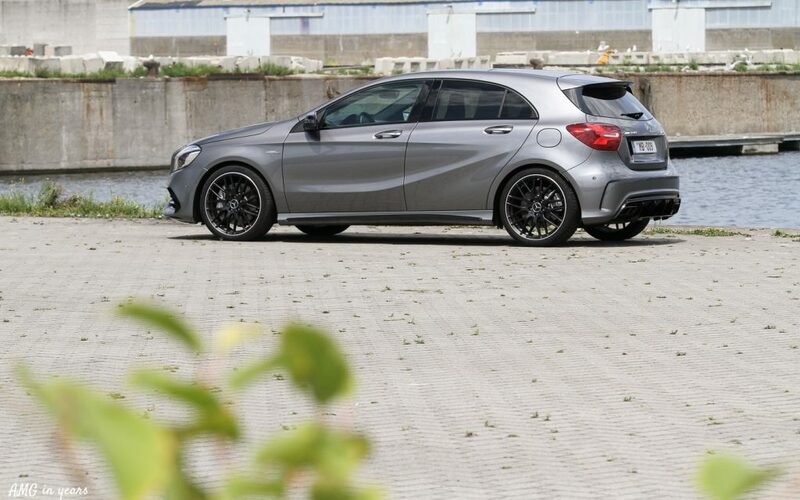 If you would order a logo-less ‘standard’ A 45, it looks rather subtle. 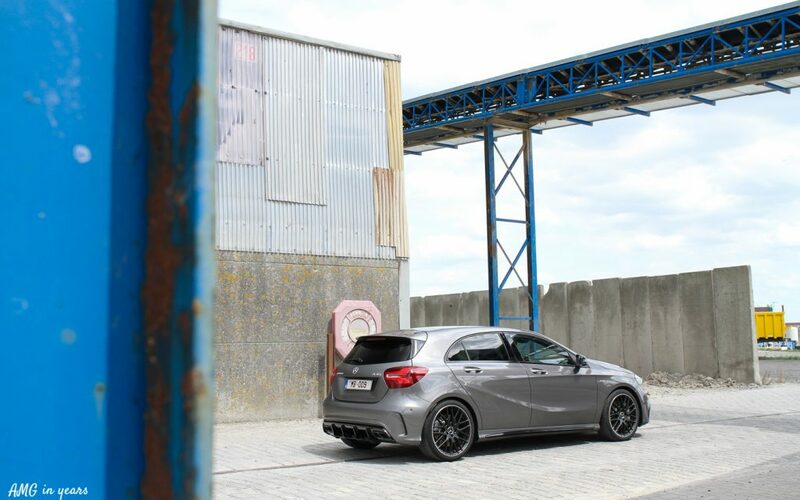 Apart from the bumper, the exhausts, diffuser and the tiny rear spoiler there is not much that exposes this powerful version of the A-Class. 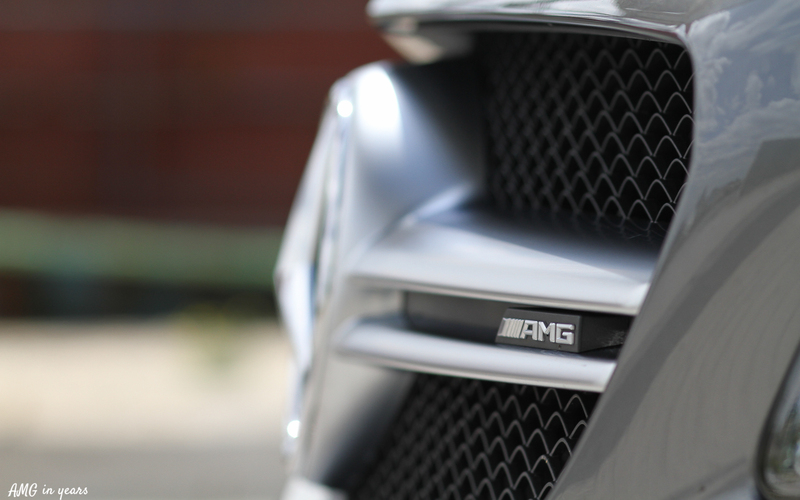 Except for the noise … Optionally there’s an AMG Aerodynamic package which includes a bigger front spoiler, a massive rear spoiler and flics on the front skirts. Talking of noise. The tested A 45 was not equipped with the optional AMG Performance exhaust system, but even without, the A 45 AMG sounds loud. Especially from the outside and when seated on the back seats. 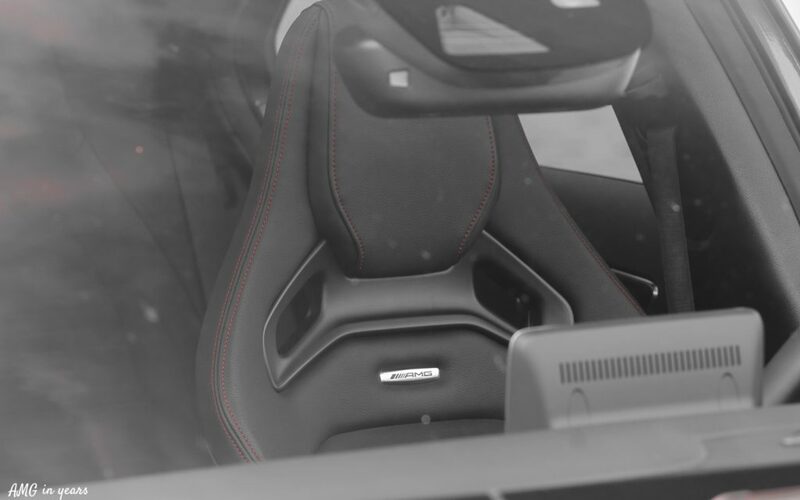 It would be perfect if the steering wheel would be positioned in front of the back seats … only if that was possible. 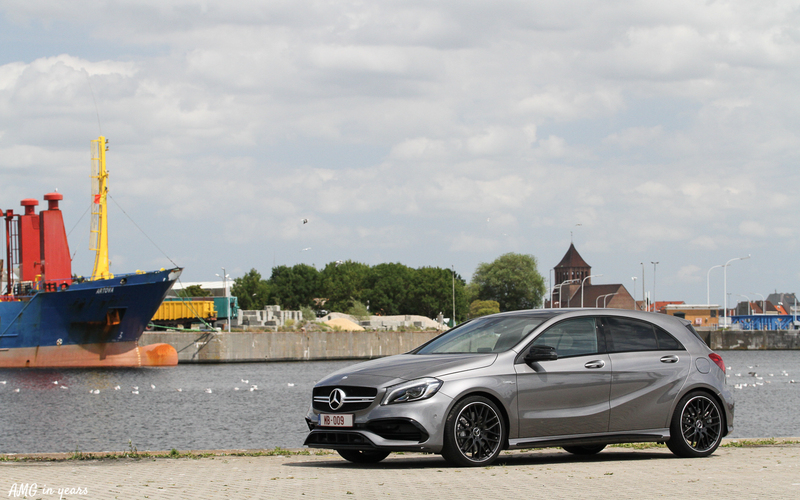 The noise isn’t comparable with any other AMG on the market (except for the CLA and GLA AMG obviously). To be honest, on the sound itself there is still room for improvement. 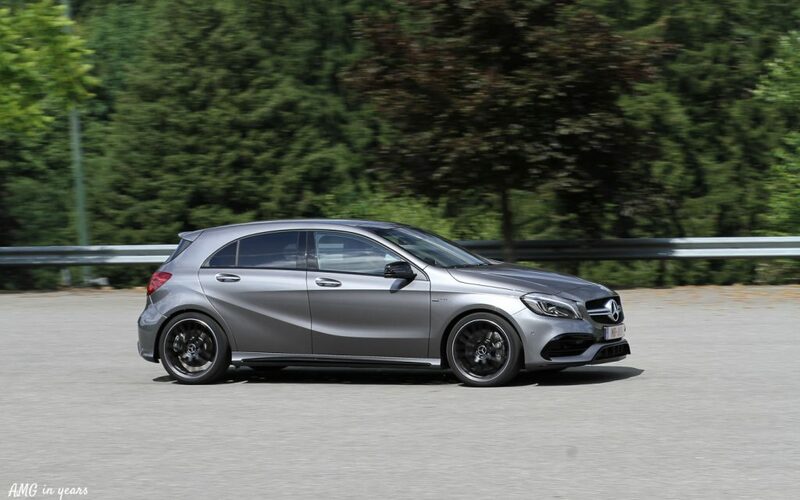 Much is related to only having four cylinders, but I’m sure AMG will find some magic shapes or engine mapping to bring the sound to a higher level with the next A AMG. The ‘issue’ is not in terms of dB, but is in terms of character. 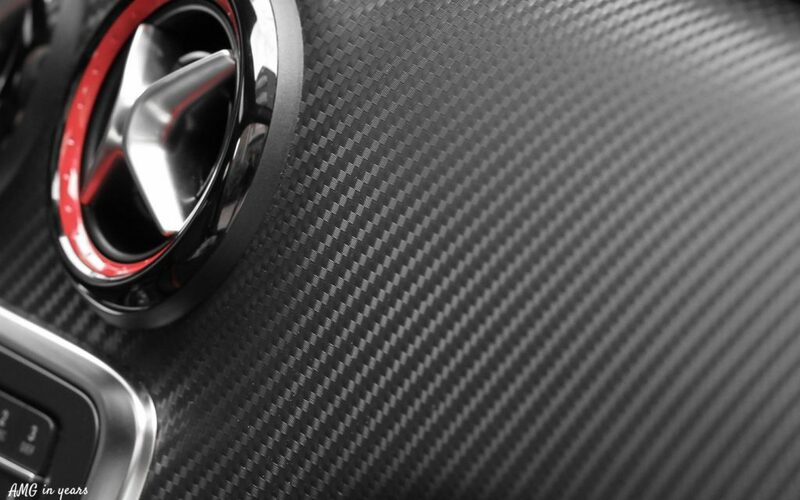 The sound is quite specific, but it could be produced by an exhaust that you find at a local car parts shop. 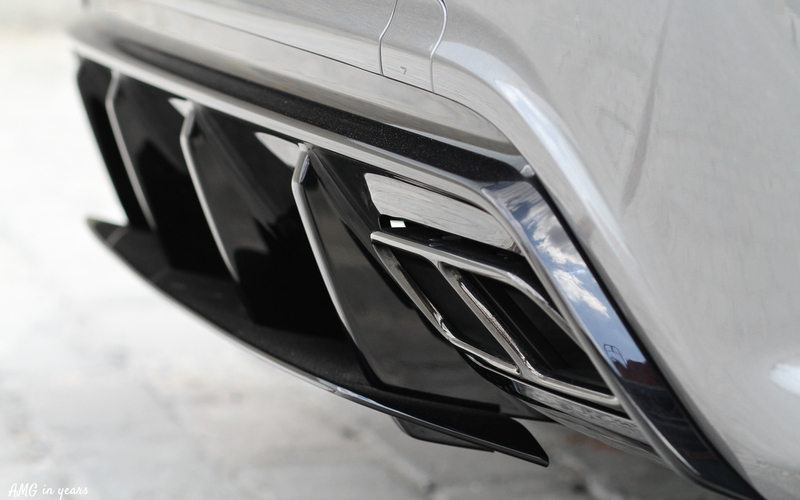 On that, competitor Audi RS3 has an edge, but probably thanks to the extra cylinder. So far our comparison with competition. Something else what the facelift brought was some additional horsepower. 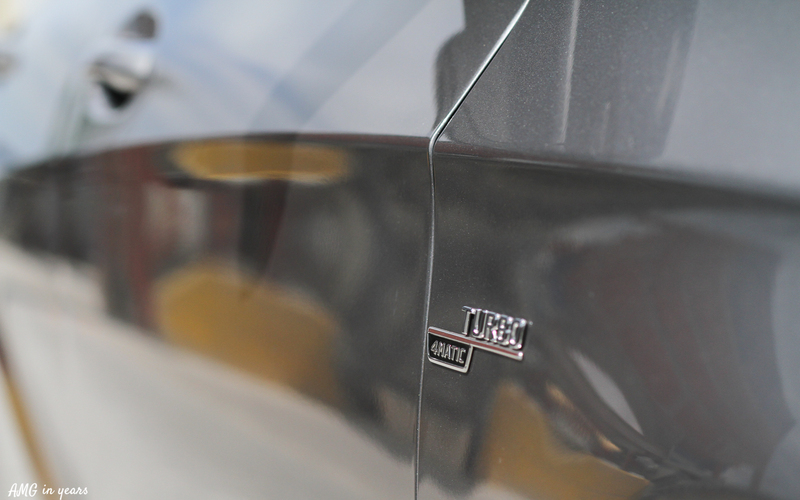 As if that was necessary … The M133 engine output grew from 360 hp to 381 hp which is available at 6.000 rpm. The extra power is available thanks to adaptation of the engine control system and a new exhaust camshaft. 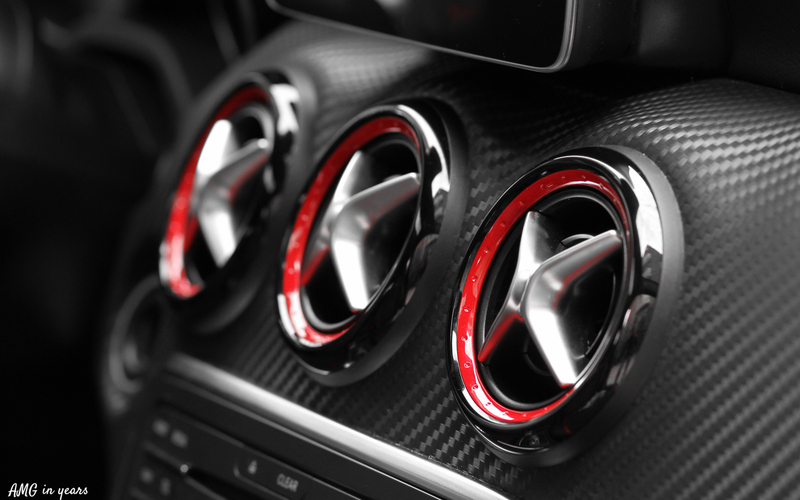 In general the engine noise is overwhelmed by the exhaust air displacement. Except if you really move towards the red zone of the rpm counter, the engine noise is clearly present. 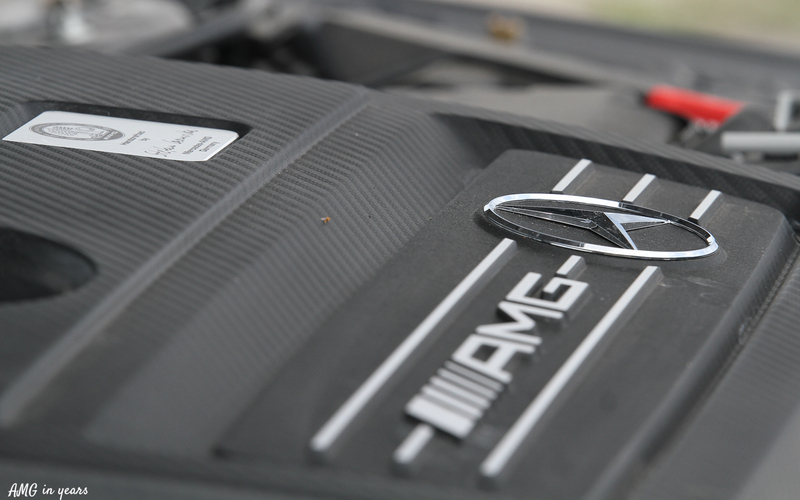 This engine is still the most powerful (factory) four cylinder engine on the market. 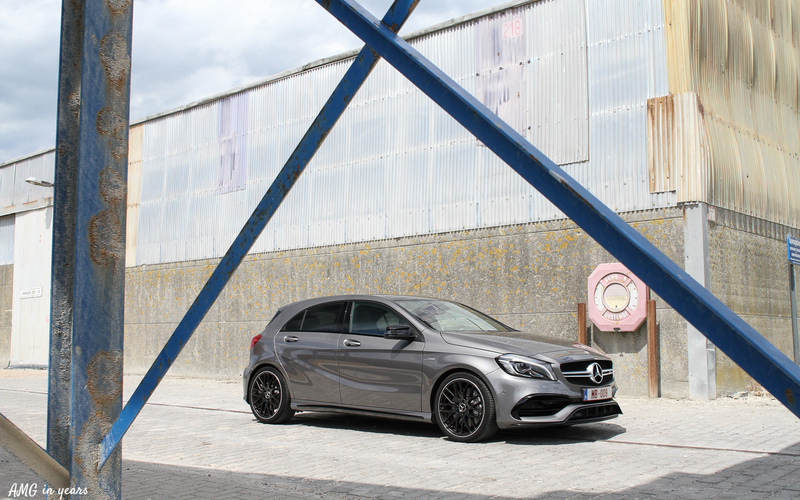 One of the most important parts of the A 45 AMG is the AMG Speedshift DCT 7-speed sports transmission. 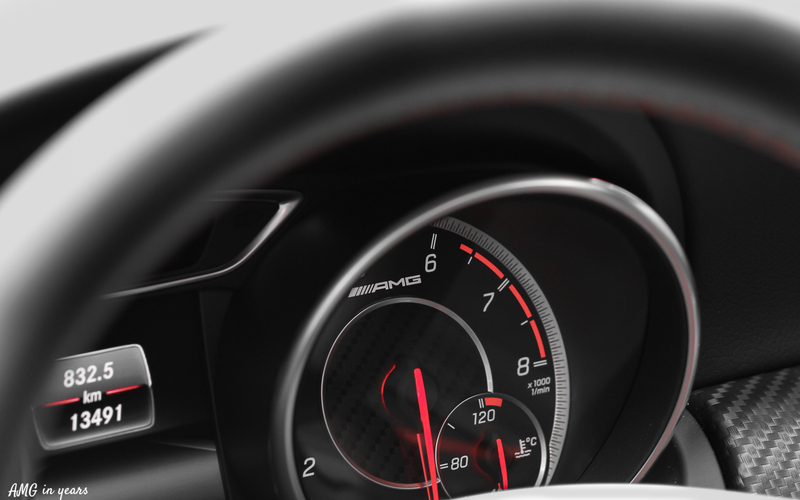 Seven gears are manageable to handle with the paddles on the steering wheel. 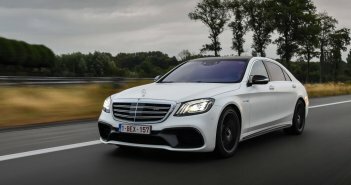 The E 63 S that we recently drove had 9 gears and there you are literally lost in gears. 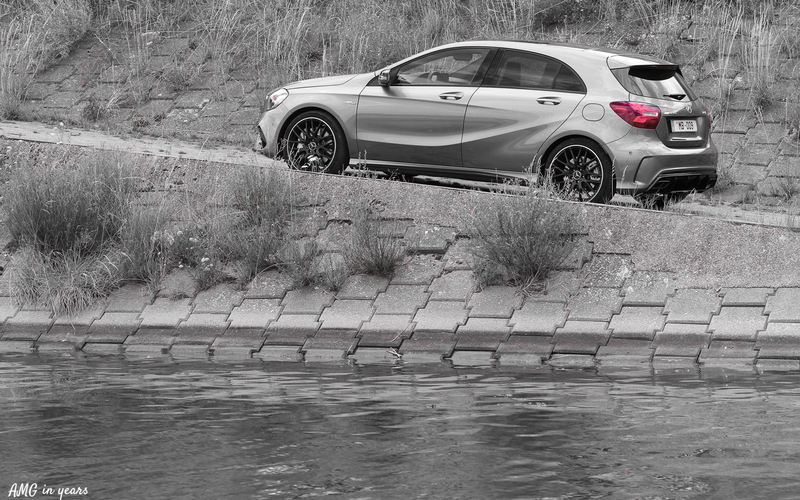 Moreover the paddle response in the A 45 is well aligned. 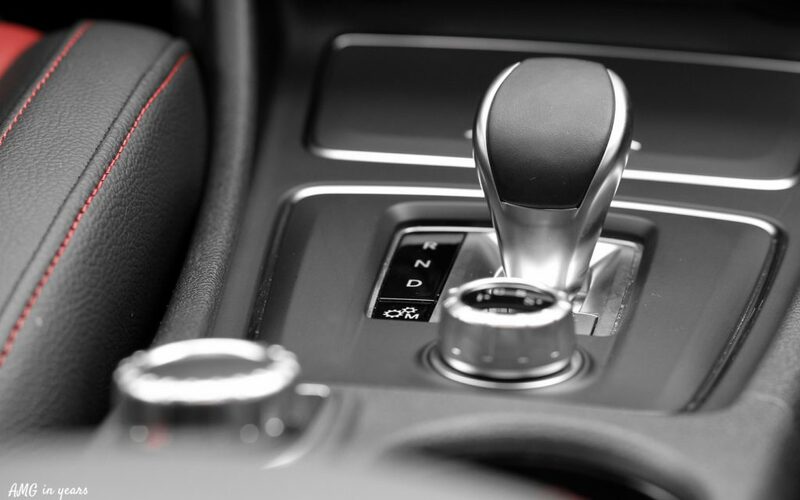 Based on the selected driving mode (Comfort, Sport, Sport + and Individual) the transmission settings are different, but in reality very difficult to spot as in each driving mode you can set the gearbox into manual mode. What’s remarkable is that even in comfort mode, the gearbox waits rather long to shift higher once the throttle peddle is stabilized. 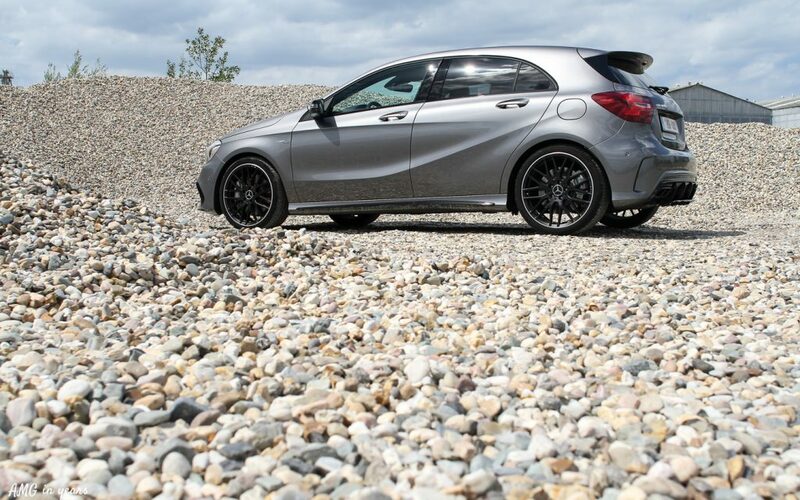 It contributes to the overall high-rpm-experience. 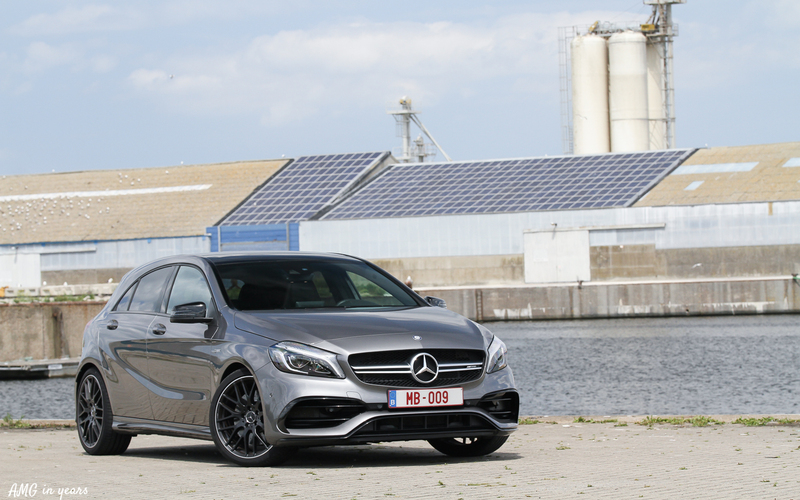 An additional RACE mode is available if you tick the optional AMG Dynamic Plus package. 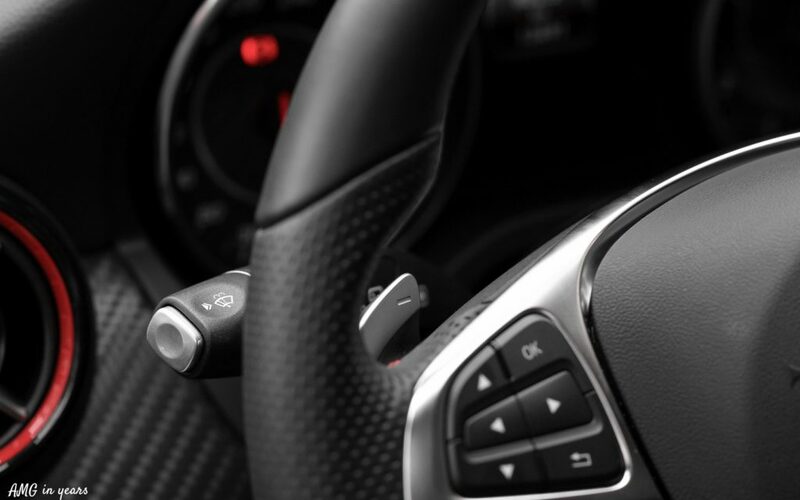 Visually it can be recognised by the AMG logo on the gear box handle and the “Race” program on the selection button. Underneath it provides a mechanical controlled front-axle differential lock which should improve traction in all driving conditions. 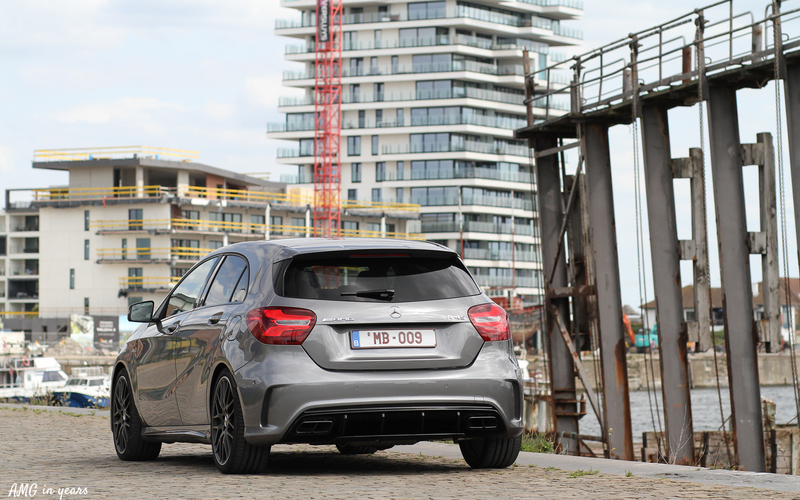 The tested A 45 AMG didn’t have this optional package, but the grip levels were more than impressive even without the specific front-axle differential lock. Going faster in corners would hurt your brains. Furthermore, the acceleration speed provides pure happiness at traffic lights. From 0 to 100 km/h in just 4,2 seconds, it looks as if other cars are standing still and they soon become a small spot in the rear mirror. Talking about the rear mirror, the view at the back is a bit poor. Not only due to the fixed head restraints, but also due to the size of the rear window. Luckily there are blind spot mirrors which should be in my modest opinion standard on every new car. By the way, launch control is only possible in Race mode. 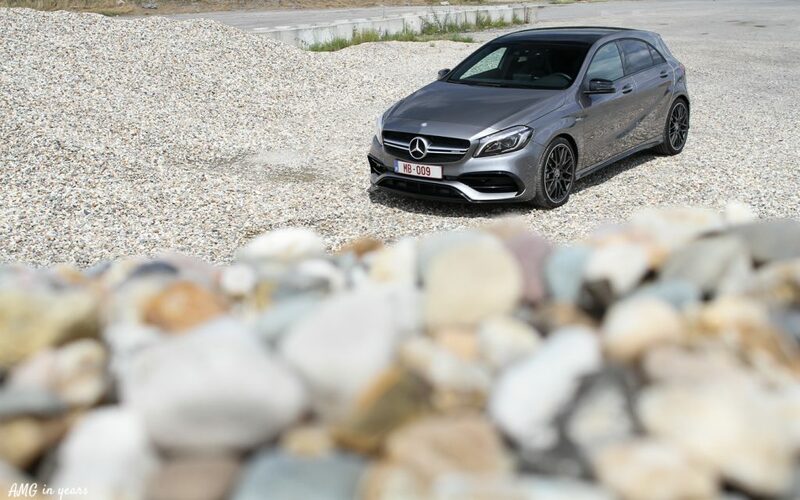 The dazzling grip levels come also thanks to the AMG 4MATIC fourwheel drive system. A multi-disc clutch with electrohydraulic control is integrated in the rear-axle differential and makes variable torque distribution possible. This means that for example on the highway only the front wheels are driven. 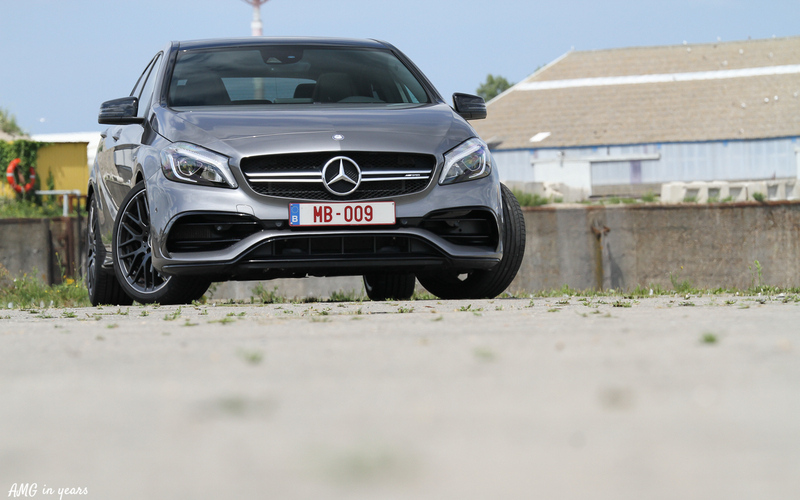 The maximum torque distribution to the back wheels is limited to 50%. 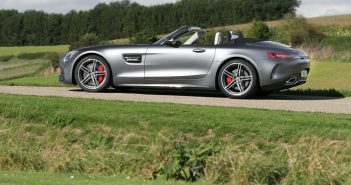 Also the chassis is extremely stiff and the AMG sports suspension keeps the car horizontal in all driving conditions, very impressive. The steel suspension consists of a front-axle spring strut, a tubular torsion bar, twin-tube shock absorbers on the front axle, and a anti-roll bar plus a single-tube shock absorber on the rear axle. If you still have some money left on the table, you can opt for the AMG Ride control sports suspension. 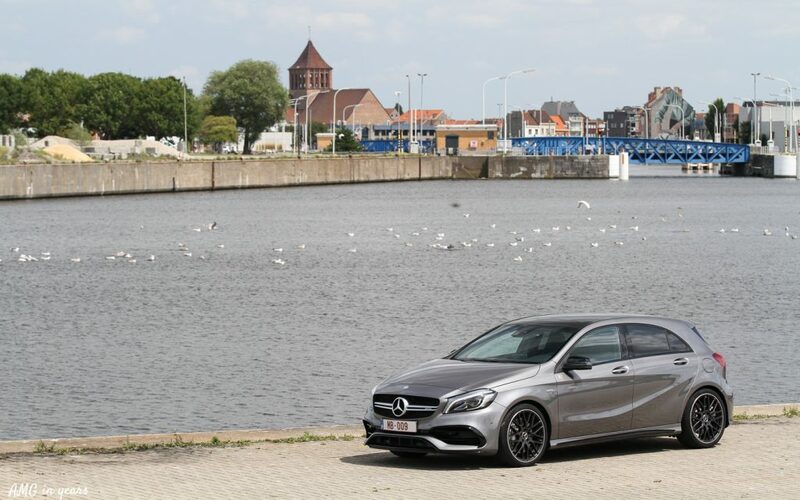 It allows the driver to choose from two modes: comfort or sport. 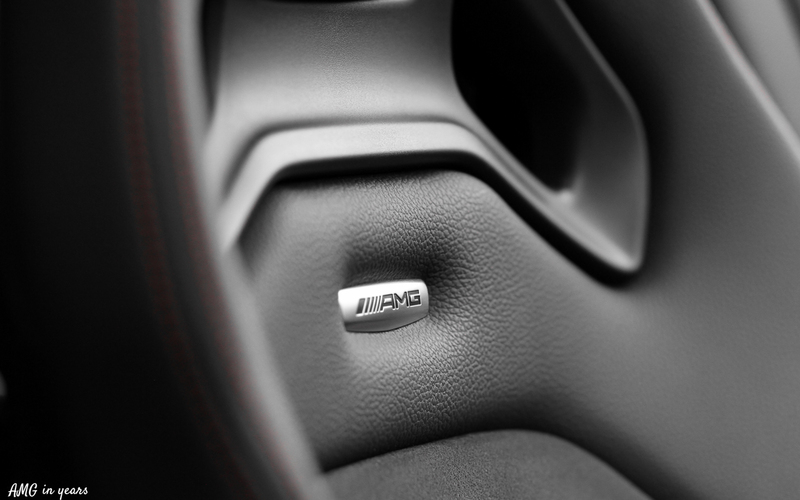 Thefore the damping is continuously monitored per wheel and also brings two different settings of the sports steering. 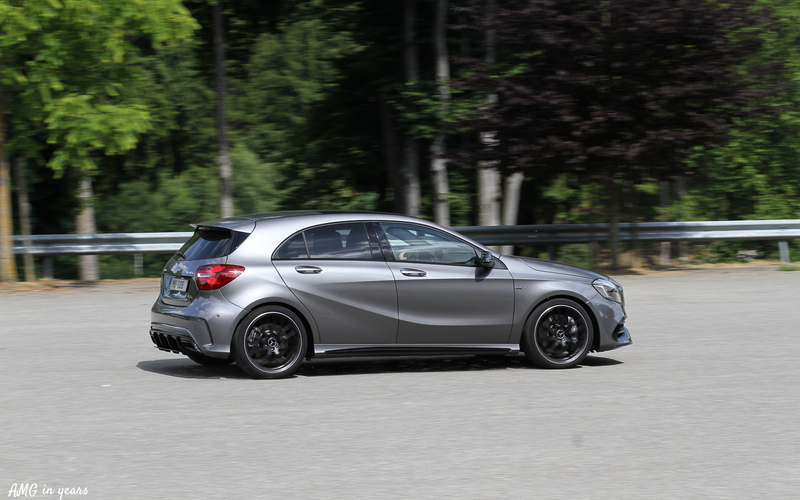 The tested A 45 AMG wasn’t equipped with the AMG Ride control so we cannot really say if it brings any value but at least the concept sounds good. 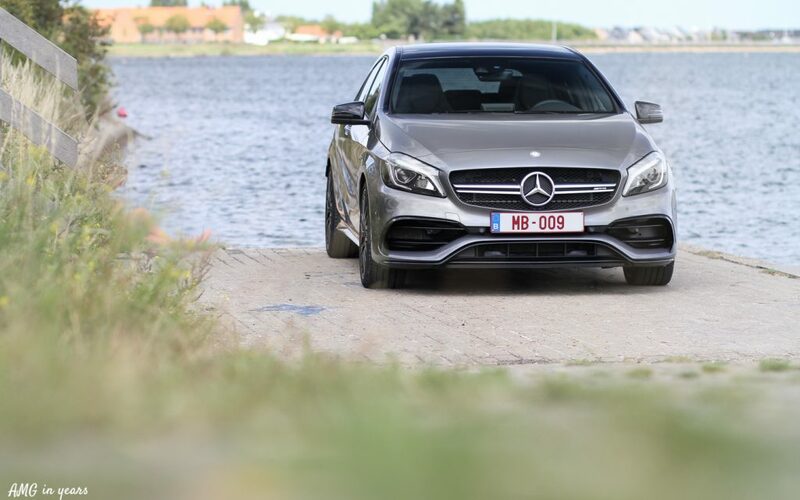 Even in ‘standard’ mode, the steering is a class on its own. It requires some habituation at start as the steering is very heavy. Driving with only one hand is not recommended. Moreover it will save some time (and money) in your local fitness. Difficult to explain, but you just feel that the steering wheel is the extended of your body. After 950 driving kilometers my lips were almost tearing due to the driving pleasure. 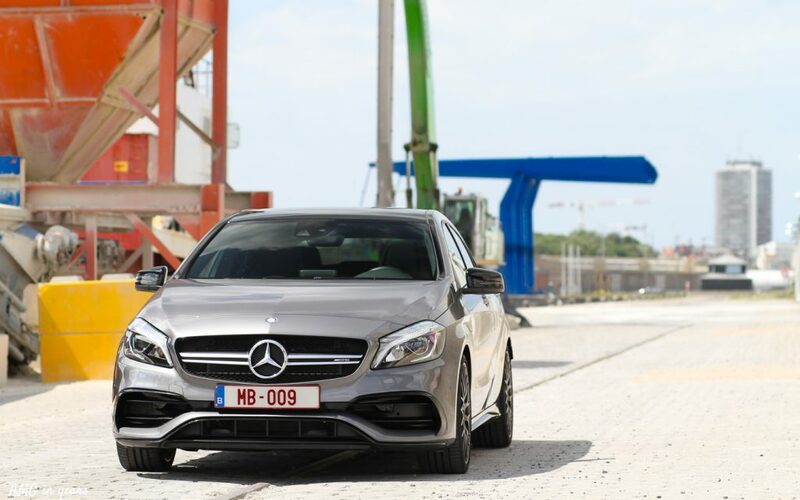 The optional AMG Driver’s package includes an AMG specific driving course and an increased top speed from 250 km/h to 270 km/h. 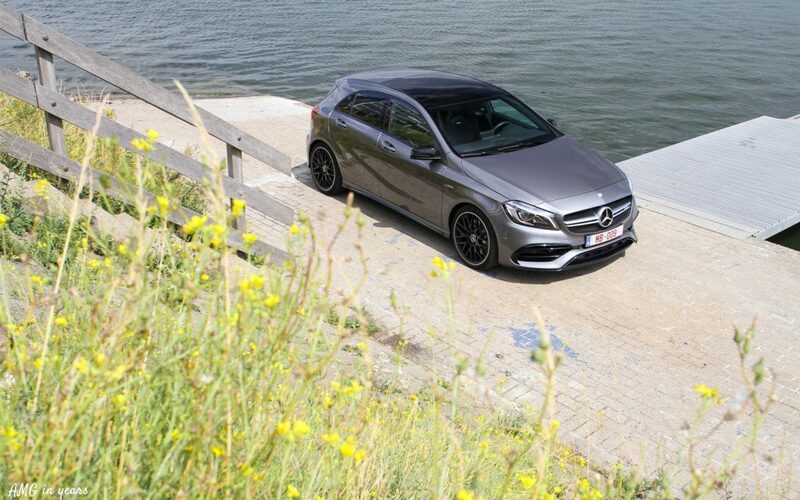 The price you pay for the driving pleasure is comfort, but all-in-all you get used to it, luckily. Compared to younger Mercedes models, the interior controls look a bit outdated, but still very straightforward. Also the floating infotainment screen sticks a bit too much to the front. 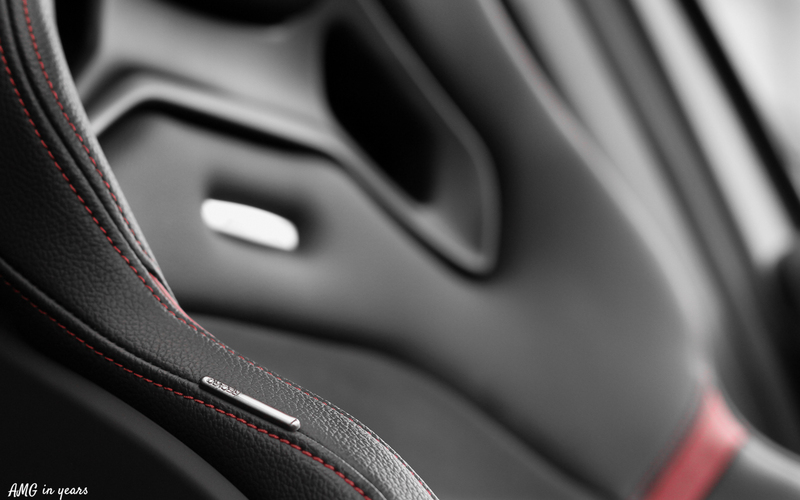 Talking about nitpicking …The ‘basic’ interior moves the attention really to what matters: driving. Maximum attention. 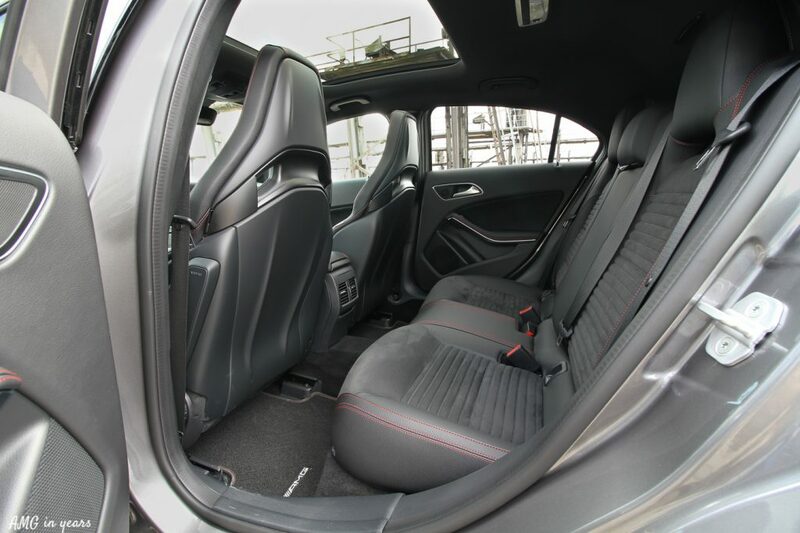 Thanks to the thin AMG performance seats (Recaro), there is actually enough space at the back. Even the headroom is rather decent as the seating of the back seats is not that high. Furthermore, the seats are made in such a way that passengers from the back can give the front passengers a ‘free’ massage. 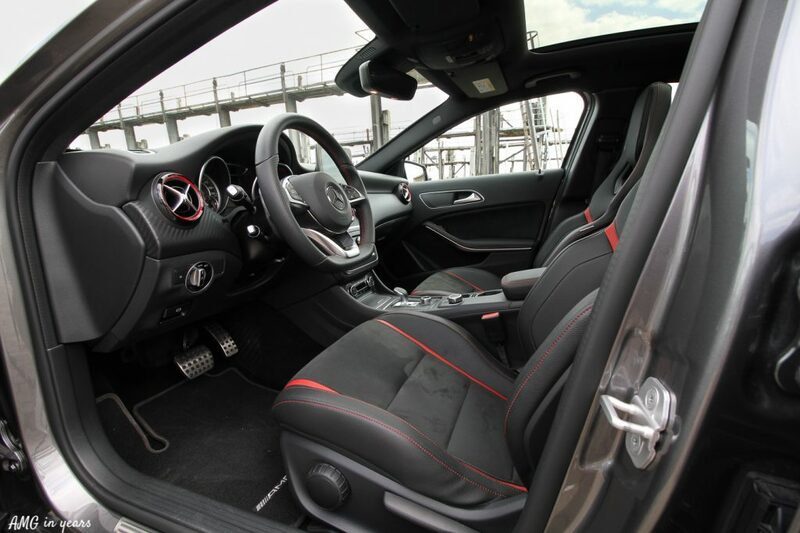 If that isn’t romantic … Choosing for the AMG Dynamic package gives some changes in the interior as well: a steering wheel with AMG logo, alcantara accents and a red center accent. Time to look into your wallet which is impacted twofold. First off all there’s the fuel consumption. 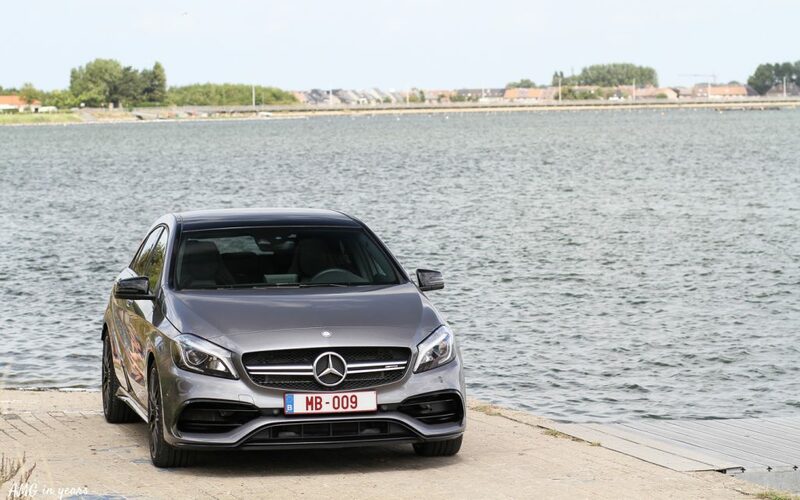 After almost 950 km driving pleasure, the average Super 98 consumptions was around 8,3 liter per 100 km. Compared to the theoretical consumption of 6,9 l per 100 km it’s still manageable but still a considerable amount of money on a yearly basis. Secondly there’s the price tag. 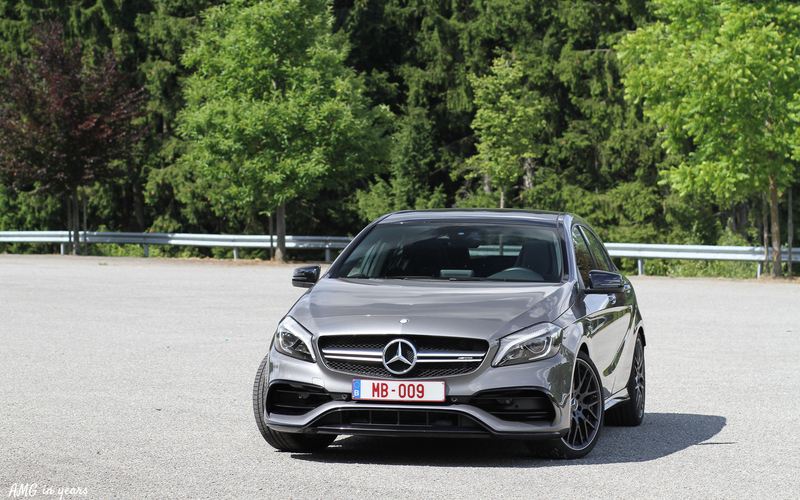 With around € 51.000 (in Belgium, including 21% VAT) this is the cheapest available AMG on the market, but still expensive. Our test model ended at around € 62.000 due to several options and packs. The Professional Pack consists of a reverse camera and the Garmin navigation system. 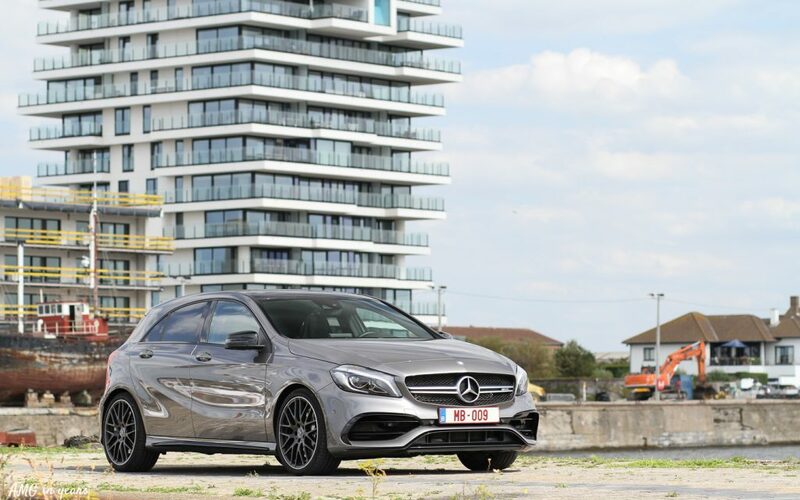 The Media Pack includes Command online and the Harman Kardon® Logic 7® Surround sound system. The Safety Pack offers blind spot mirros and parking pilot. Next to that there was also the Comfort Pack consisting of automatic climate control, heated front seats with extra lumba support. 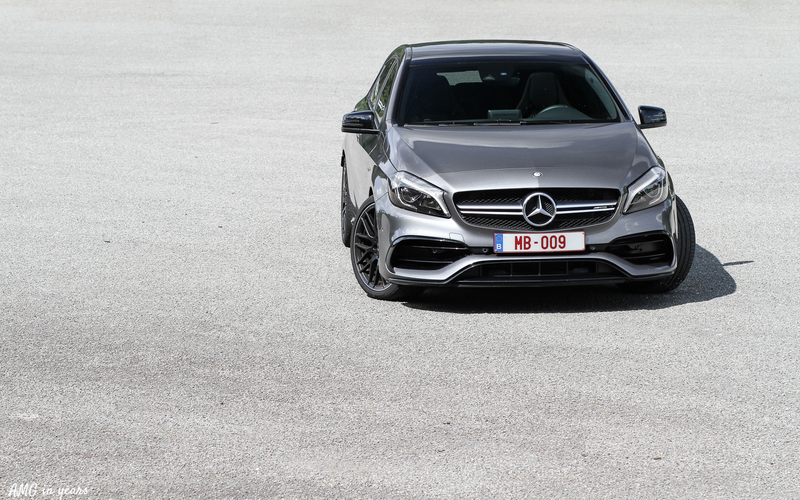 Visually the AMG Night Pack brings several black accents on the exhausts, front splitter and side mirrors. Things you don’t really need if you don’t like spending money on it. 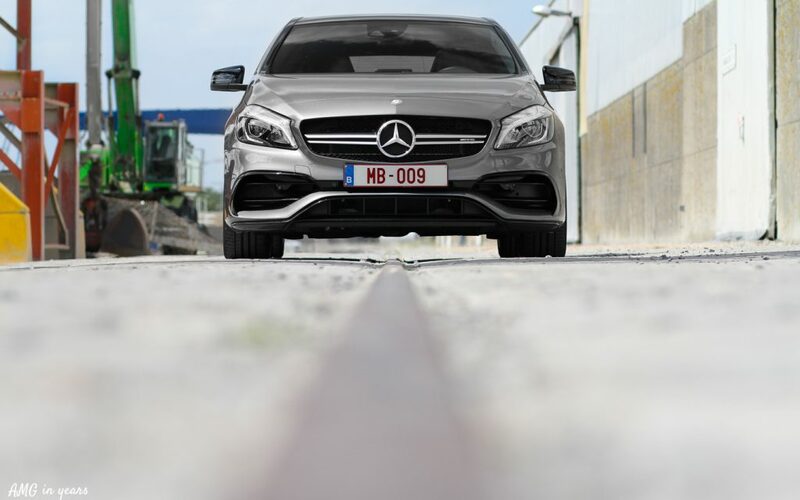 Special thanks to Mercedes-Benz Belgium!